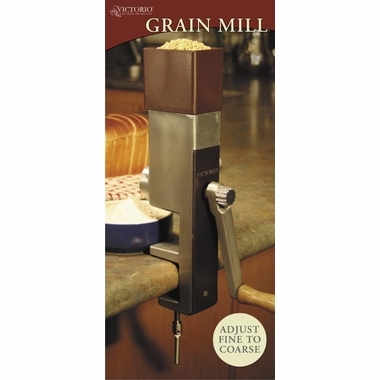 Now you can relish the homemade bread spawned from the wheat you mill yourself using the Victoria Manual Grain Mill. The Victorio Manual Grain Mill gets you riddance from commercially processed flour that is added with synthetic preservatives. The Victorio Hand Grain Mill is purely based on geared mechanism requiring no electricity for its functioning. Takes free hand to operate and it comes with an adjustable knob for getting desired texture of flour whether coarse or fine. It can be easily mounted on your kitchen slab with the help of a clamp and screw mechanism at its base. It appears traditional but equipped with modern components that make it lightweight and handy for it easily fits in a drawer or cabinet.